Let’s get straight to the point here - are you or not? For some women it’s the night sweats and hot flushes that are the giveaway. For others, not a drop of wetness shall pass, it’s all about overwhelming anxiety and fatigue. None of the signs are wonderful – there’s not a single super power listed among them – but it’s handy to have a list to check, just for starters. Allergies Any you have seem stronger than usual. Body odour changes Sweating more, and a change in your ‘normal smell’. Electric shocks Under their skin. Hair changes More facial hair, but thinning hair elsewhere. Mean anything to you? No, me neither. It’s about as useful as reading a biology book at school to understand why you feel wretched once a month. That’s the theory, so what’s in like in practice? Like anything, each one of us will experience the build up to the menopause in our own unique way. While there will be some uniting factors, (getting hot, sweaty, anxious and grumpy seem to be the main ones), there are a whole host of symptoms and experiences that come under the umbrella term of ‘menopause’. The menopause is a natural change in a woman’s life; it happens when your ovaries stop producing eggs. Your ovaries also make the hormone oestrogen (a chemical substance). So when they stop working, there’s a drop in your blood level of this hormone. 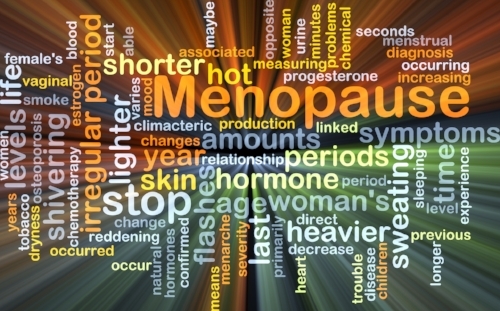 This change disrupts your periods and causes the symptoms associated with the menopause. The menopause usually happens gradually. For a few years before the menopause, your periods may become irregular, happening more or less often than they used to. You may also have slightly heavier periods. This stage is called the perimenopause and can last for about four years. You can still become pregnant while going through the perimenopause, so you need to keep using contraception if you don’t want to get pregnant. Doctors usually recommend stopping contraception at 55, because most women are in the menopause by this age. My advice would be to start keeping a diary of your symptoms. That way, when you visit your GP you have a comprehensive list of dates, of physical and mental symptoms to look back on, which will help you both decide which is best way to move forward. There are great menopause Apps out there to help you too: Menopause Diary 2, Menopause View and Hot Flash Sisters are just three that I’ve come across. I haven’t used any of them so I can’t vouch for them personally, but they could be worth a shot. Other than that, you can’t beat notes in your phone or scribbles in your diary or notebook. Whichever works best for you. Whatever you decide to do from here, don’t panic. It’s all going to be OK.